SSR operates a diverse fleet of locomotives to ensure a personalised service package can be optimised to meet every customer’s requirements. Locomotives range from high horsepower to branchline horsepower models that deliver the operational flexibility required by our customers. SSRs locomotive fleet can also be expanded quickly when required to include leased locomotives from suppliers such as Consolidated Rail Leasing Pty Ltd. Medium horsepower locomotives provide the same reliable and safe haulage as the high horsepower locomotives with the added flexibility of having lower axle weights. Lower axle weights make the medium horsepower locomotives ideal for accessing weight restricted track networks that may apply to regional products such as grain or freight. Branchline horsepower locomotives are able to maintain efficiency for lighter haulage tasks ensuring optimal costs can be realised for these types of services. These services may include haulage for metropolitan ports, track infrastructure, regional grain, yard shunting or freight. SSR operates a range of different wagon classes to suit a variety of customer products. Whether moving coal, grain, other bulk commodities, or any type of containerised service, SSR’s has a suitable and cost effective wagon solution to suit our customers requirements. SSRs wagon fleet can also be expanded quickly when required to include leased wagons from suppliers such as Consolidated Rail Leasing Pty Ltd.
SSR operates a diverse range of container wagons. Modern, efficient and reliable container wagons ensure that SSRs customers experience the full benefits of SSRs professional service for rail freight in NSW and Victoria. Modern coal hoppers capable of high payloads, as a result of low tare wagon weights, make SSR operated coal hoppers one of the most efficient and cost effective coal moving solutions. SSR has access to modern grain hoppers for customers looking for an extremely cost effective solution for moving grain from regional areas to the cities or ports for export. 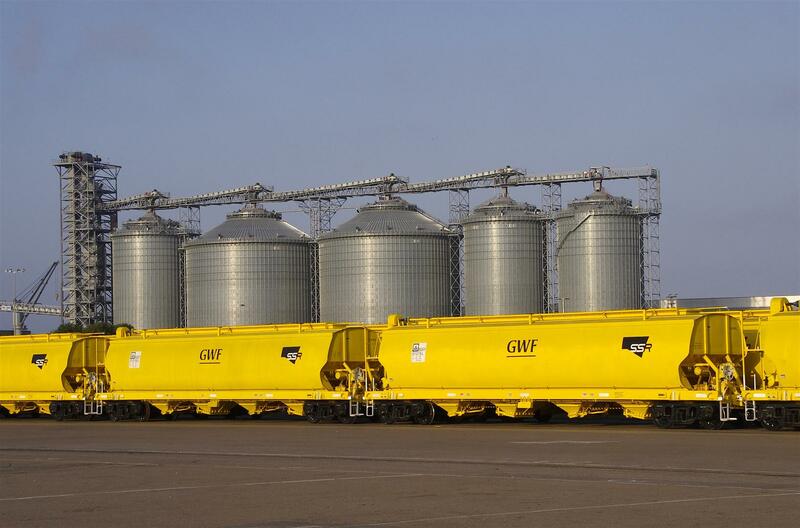 Some customers also look to move grain in containers that can be transported using SSR’s container wagons.